Asus has unveiled its new DirectCU II graphics cards with dual-fan cooling – offering both the latest AMC and Nvidia chipsets. 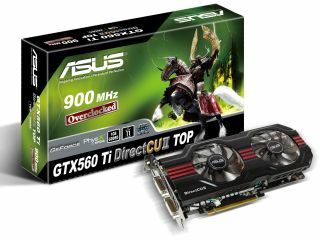 Asus' latest graphics cards include the brand spanking new Asus HD GTX 560 Ti – utilising the latest Nvidia chip on the market - but also the rest of the GTX 500 series and the HD 6900 series. The cards include the company's proprietary DirectCU II cooling technology which utilises copper heat pipes in direct contact with the CPU itself to reduce heat. The cards also utilise "Super Alloy Power" technology – which is featured in the chokes, capacitors, POSCAPs and MOSFETs – and apparently offers a 15 per cent performance boost. "Asus has launched an entire range of DirectCU II-enhanced graphics cards that include the latest technologies from both AMD and Nvidia GPU rosters," explains Asus. "On the AMD side, Asus offers the HD6970 and HD6950 graphics cards with DirectCU II while for NVIDIA, the GTX580, GTX570 and new GTX560 Ti all ship with the advanced cooling technology."